Who Cares What Nation’s Restaurant News Thinks? Here’s My Top 10. On the same day the New York Times wrote about Pop-Tarts World, the Huffington Post added this blurb from a Nation’s Restaurant News report on America’s favorite restaurant chains. 10. Quiznos/Subway — I like toasted sandwiches and LOVE QUIZNOS’ CATS. I could also go for a sandwich from Subway with everything in it — even the peppers — just about any day of the week. But only if it has everything. 9. In-N-Out — While I think In-N-Out is somewhat overrated — YES, I JUST SAID THAT — it’s a classic burger joint and it does things right, which earns it a spot at #9. 7. Swensen’s — I have found memories of getting ice cream here as a child. Unfortunately, all I can remember is that it was good. 6. Coco’s — I used to go with my grandmother (who hid in a booth in a corner). I have fond memories of Coco’s southwestern melt (see? Told you I like toasted sandwiches….) and boysenberry pie. 5. Panera — This joint has one hell of a muffin…and was also the focal point of my first (…and admittedly only…) story in the Wall Street Journal. 4. Sizzler — A popular joint with my maternal grandmother. I loved the cheese toast and was once a bit of a smartass when the manager asked if everything was okay and ended up with an entire platter of it. 3. Baja Fresh — I perhaps love nothing more than Mexican food. And I think this place does a fine job. I don’t care if Wendy’s owns it. 2. Chevy’s — Annnd…I don’t care what Jonathan R. Duke says either. I love this place. Always have, always will. And I have the birthday sombreros in my closet to prove it. The cookbook proved to be a little overly complicated, but that’s just fine — gives me a more powerful excuse to go there in person. 1. 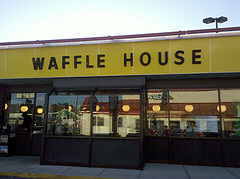 Waffle House — I also have fond memories of the Waffle House, which I will forever associate with my brief stint in Mississippi and Georgia. Plus, their menu development team was genius — who doesn’t like saying, “Scattered, smothered, covered…”?